Life can be seen as a path. Along it we occasionally come across signposts. These signposts appear in the form of people, books, films and experiences. You know it is a useful signpost when it changes your life's direction for the better. Here is a signpost I found when, as an artist, I visited the world of otherness. In Japan there once lived a famous painter, who was approached by a businessman who wanted a painting of a fish for his office. The painter agreed and the businessman paid a large sum as a deposit. After half a year the businessman contacted the painter and asked how the painting was developing. 'Not quite ready,' the painter replied. Some time after, the painter rang the businessman to tell him the painting was ready. When the businessman arrived, the painter chose a beautiful sheet of handmade paper. He chose his brushes and prepared his paints. 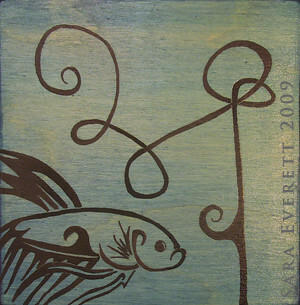 Then with a few strong and deliberate strokes he painted the most beautiful image of a fish. Exquisite. The businessman was amazed and surprised. Why, he wanted to know, did he have to wait so long and pay so much money for something that took so little time and effort to create? The answer, the painter told him, would be found in the large cupboard in the corner of the studio. When the businessman opened the cupboard, thousands of practice paintings of fish fell out.